Successfully Added 802.11N High Speed Wireless PCI Card with Dual Antenna to your Shopping Cart. 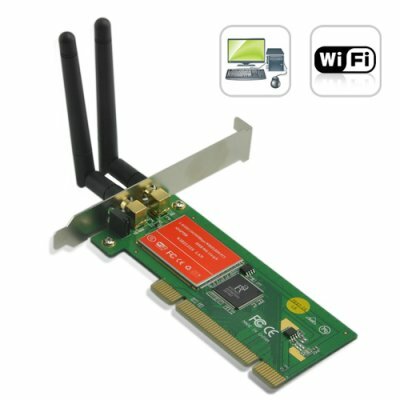 802.11N High Speed Wireless PCI Card with dual antenna for permanent wireless internet on your computer at an amazing 300Mpbs speed. The easiest and most reliable way to connect to a home/office router or wireless network. This PCI card uses two external omni-directional antennas to provide the highest level of wireless performance in the industry. High transmission speeds and guaranteed stability and coverage is what sets this PCI card apart from the rest. Along with an indoor range of up to 100 meters, you can also move your PC to anywhere in the apartment or office without having to worry about whether or not you can still access the internet. This PCI card uses next generation 802.11N data transfer speeds and also supports the previous standards of 802.11G (54 Mbps) and 802.11B (11 Mbps). The new 802.11N standard, however, is over 5 times as fast (5x speed!) and provides an amazing 300 Mbps data transfer rate. The 802.11N High Speed Wireless PCI Card with Dual Antenna is in stock now and available for single and bulk purchases. Click "Add to Cart" now and we will express ship it to you the very next day along with our famous 12 month warranty. Brought to you by the leader in China Electronics - Chinavasion. Adopts MTN WLAN transmission technology, transmission distance is 2-3 times of the normal products, transmission range extended to 4-9 times. How does the wireless 802.11N PCI card work? This high speed PCI card is very handy if your desktop computer does not have a wireless internet card or you want to upgrade your existing connection to the new "N" standard. If you have a wireless internet connection at home or the office, and need a wireless card to connect to the internet, simply install this unit into the standard PCI slot and wirelessly connect to the net!